About the author : Ben Martin is a research and business development associate at Thera Rising Intenational. He also delivers seminars and oversees digital development. Imagine for a moment that it’s time to hold someone accountable. This person can be a colleague, classmate, family member, friend, or anyone else. What adjectives would you use to describe your approach. Strong? Great! Persistent? For sure! Assertive? Absolutely! Now how about Warm? The thing is, research shows us – and experience has born it out – that warmth is really important. Along with being a great way of building strong relationships, it’s a strong tool in establishing accountability and creating positive change. With this model, we can get a lot more nuanced. Let’s take a quick look at each quadrant. In the top-left, we’re both hostile and assertive. This is sometimes called “hot contempt.” We don’t see this often at work, but we see it all the time on the news on small and large scales. Hot contempt and indignation can be intoxicating, but they’re generally not the best at leading to constructive change – as we’ll see in a moment. Let’s go counter-clockwise to the bottom left. We’re still hostile, but now we’re being passive about it. This is called “cold contempt,” or simmering resentment. These behaviors include backstabbing, sabotaging, and avoidance. This is much more common in the workplace, and also often crops up with family and peer groups. Like hot contempt, we’re stacking the deck against ourselves when we take this approach. Because these behaviors less in-your-face than hot contempt, they’re sometimes seen as safer or less “bad.” But they’re usually no less toxic and destructive in the long run. Now we continue to the bottom right. Here, we’re warm, but we’re also being passive – often called being a “doormat.” Now we’re treating the other person with warmth, but we’re also passive. That means we’re likely to be trampled over. In situations where we’re the authority figure, we’re abdicating our responsibilities. This is often done with the hope of avoiding conflict. As a Minnesotan, I know all about being conflict avoidant, believe me. But avoiding conflict is hardly even a long-term solution, especially when it means abandoning responsibility. That brings us to our last quadrant – the top right. Here, we are being both warm and accountable. 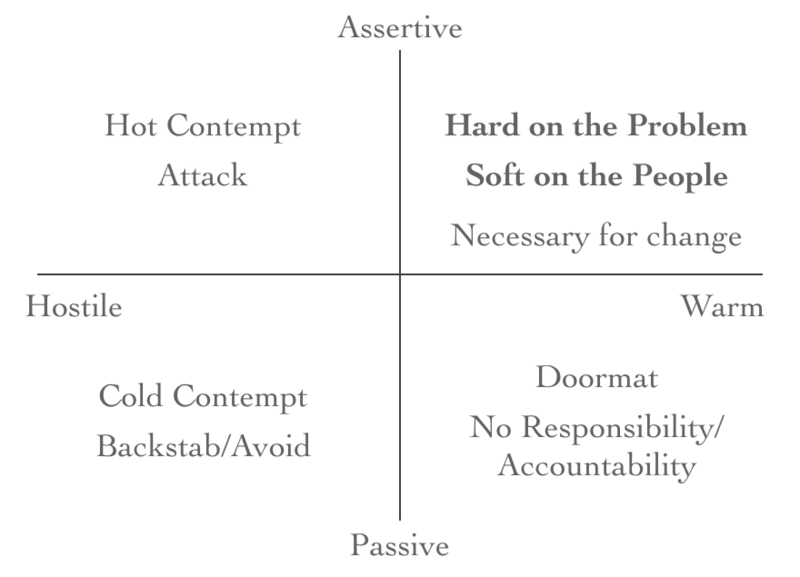 We call this approach “Hard on the problem, soft on the people.” This combination of warmth, high standards, and consequences (when appropriate) not only helps us maintain strong relationships – it’s also a powerful tool in building accountability and encouraging positive change. Studies in neuroplasticity have shown us that being in an environment of warmth physiologically primes the brain to be more receptive to change. This is because when we humans feel like we’re under attack, we double down and get defensive. That makes us much more likely to resist change than to open ourselves to it. Think about what state of mind you would be in for each conversation. Are you going to get indignant and angry? Will you double down? Or will you decide that maybe you can meet the other person halfway? Looking at it this way, we can start to see just how much of an impact this combination of warmth and assertiveness has – on ourselves and on others. To learn more about how to set you up for success in these often-difficult conversations, keep an eye on the blog (or subscribe!) as it’s a subject we’ll explore in depth later. In closing, think about how this ties into reciprocity. (Remember, it’s 96% reliable!) If we approach someone with contempt, they’ll usually treat us the same way. But if we treat others with assertiveness and warmth, they’re likely to respond in kind. Using that to our advantage can be a huge asset in all areas of our lives. 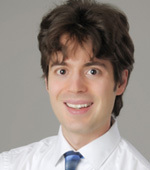 Ben Martin specializes in research and business development at Thera Rising. When he’s not out delivering seminars, he oversees client outreach and digital development. Want to see more? Subscribe to have new posts delivered to your inbox! We’re Back Online! Why is Everyone on the Internet So Mean? Time-tested strategies for lifelong resilience, happiness, teamwork and trust – delivered right to your inbox! Why is Everyone on the Internet So Mean? Visit Thera Rising's homepage at www.TheraRising.com. © 2019 Thera Rising, Inc. All Rights Reserved.